The greater use of pass through entities since 86 tax reform act has had a major impact on income inequality numbers, but not as much as the enactment of the "passive loss rules" in the 86 reform act. To get an idea of the impact of these changes look at income shares of different income groups from 1998 to 2011 (last year data for which data has been released). Basically no change. Why were there big changes from 1980 to 1998, but none thereafter, with most of change from 1984 to 1992 (which is years reform act was proposed or phased in). PS: 2012 will show big increase in share of top 1% as increase in tax rates caused top earners to trigger income in 2012 to avoid higher rates going into effect in 2013. This will disappear in 2013. Interesting. 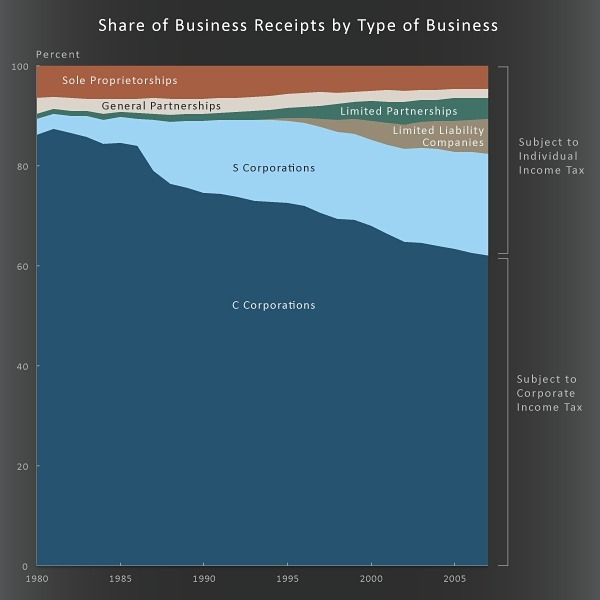 I've been using S-Corps for years and now my new tax attorney is pushing me back into C-Corps, even for smaller entities (double-taxation can still be avoided by zeroing out the corps at the end of the fiscal year). Basically the reduced marginal tax rates cause a shift from C-corporations to S-corporations.
}}} like sub-chapter S corps are skewing income trends, particularly for the highest earners. I suspect you mean more like "highest quintile" earners or something like that (decile?). The HIGHEST "income earners" are not even PAYING substantial income tax, because most of their income is sitting in Tax Free foundations which they control but which only provides them a minimal income by comparison. Several years back, when Buffet was making news for "paying less of a percentage in income tax than his secretary", the REAL fact was that he wasn't paying JACK for income tax. Buffet's worth around that time was officially 26 billion or so. Even if he was earning a paltry 5% on it (economic downturn and all that), that would mean his "income" was 1.3 BILLION dollars. The "income" he was purportedly paying taxes on, for comparison to his secretary, was something like only 56 million bucks. What happened to the OTHER 1.25 BILLION dollars in "taxable income"?? Oh, right, it wasn't "taxable income" at all. So jacking the "tax rate" up would not touch his income in the least -- no, it would screw over the upper-middle guys, though. Note -- this is not a diatribe against Buffet by any means. I'm just noting that "income equity", even IF you grant it to be a desirable goal, is not going to come by changing the tax rates on "income" until/unless you get rid of tax-free foundations. So -- Warren -- asking this question is silly and irrelevant. It's not SCorps or CCorps that boost "income inequity", it's the abject failure of the media to even mention this concept of tax-free foundations -- EVER -- to the people. Most people, you ask them about them, won't have the slightest clue what you are talking about. This is particularly so for the kind of clueless lackwit who whines like a beyotch about "income equity". You are confusing income with unrealized capital gains. obloodyhell, while you are correct that tax exempt foundations are a tax shelter for the very rich, and should be subject to income tax (as should investment income of university endowments ), I doubt very much you are talking about numbers that would impact any income inequality debate. Remember the cutoff for the top 1% of taxpayers (about 1.3 million households) is about $400,000. The cutoff for the top .1% of taxpayers (about 130,000 households) is about $1.3 million or so in income, and most only earn that number for 1 year (and there is a lot of movement in and out of top 1%). So while I am 100% with you private foundations should be subject to income tax, not talking about enough people or income to impact numbers in a meaningful way. To give you another spin on the numbers, I have seen estimates that only 60,000 households have $30 million or more in investable assets. That is your target for private foundations, and my guess is you are only talking about 10% to 30% of that group, so 6,000 to 18,000 households (again, think bell curve, a lot more households around $30 million than over $100 million). Thank goodness somebody brought this up. "The one percent" is not a static bunch, the same people from year-to-year. might not decrease the NPV of someone's earnings over his lifetime. should be worried about anything, I mean. income if there are high marginal rates, and there are a thousand ways to lower one’s taxable income; however, each way has a cost in terms of lower flexibility and higher fees. Therefore, saving against high marginal tax rates makes it worthwhile to accept loss of flexibility and pay the fees. When rates are lowered, the wealthy are less inclined accept the cost of tax avoidance. They will end up reporting higher income and actually pay more in taxes even though their wealth may be the same. There is limited incentive at lower income levels to report more income at lower rates. NEVERTHELESS, the action of the wealthy is only half of the story. Through programs installed in the last couple of decades, the poor are incentized to file tax returns even if they are not required to do so. In the past, they did not file returns and their low incomes did not get included in the analysis. Now they file tax returns to get Earned Income Credit, Making Work Pay credit, refund of Social Security taxes through Child Tax Credit, and the list goes on. Therefore, the poor now seems to be poorer because very low income levels are now being filed even though they probably are better off now than decades ago. While I don't disagree with you Aninquirer, I think it is important to remember we are not talking about a general "thousand ways to lower one's income" pre 1986 tax reform act. There was a major tax shelter industry, where one could legally reduce one's income. While it required the purchase of a tax shelter, on an after tax basis these were no lose investments. The only real issue was it required advance planning. Absent advance planning, one was required to either pay tax or purchase borderline tax shelters (borderline either in investment quality or whether it would pass IRS muster). As to your second point, I don't really know (as a tax lawyer, never represented lower income taxpayers). You may be right, but note lower income taxpayer in prior years were actually required to pay tax, so impact might be a bit less than you think. 1) I am not arguing for subjecting them to taxation at all -- I'm pointing out that IF your goal is to get at the "rich bastards", then raising INCOME TAXES is NOT going to do it. 2) And rather clearly, if you consider the point, I'm not confusing unrealized capital gains with "income" -- they are, nominally, a form of income no matter what the tax laws classify them as, when you use "income" in the sense that the average person does, which is "wealth/value/money I have THIS year which I did not have LAST year." I'm conscious of the more "nuanced" distinction, and even the reasons for it. But that's not what the idiots talking about "social justice" think at ALL. So, again, the point is, they're trying to get at something and using a pencil to get at it instead of a shovel. And the stupidity of that improper tool usage has nothing to do with the separate kind of stupidity that is involved in actually aiming for the target in the first place.